Jet Seal is a durable paint protection sealant designed to shield your vehicle's exterior from the harshest elements. 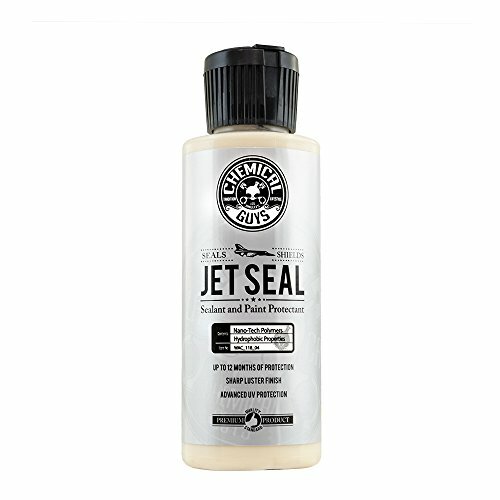 Developed exclusively for the aerospace industry, Jet Seal is engineered using advanced Nano-Tech polymers that provide the ultimate level of protection. Revolutionary super polymers create a smooth finish with a brilliant shine. Jet Seal is formulated using innovative UV protection technology that protects your paintwork against fading and discoloration. Jet Seal bonds to the surface creating a strong shield against water spots, contamination, road grime, and solar rays. The ability to chemically bond to paintwork allows Jet Seal to produce fantastic results and a mirror shine. Jet Seal provides durable protection to paintwork, glass, chrome, aluminum, carbon fiber and fiberglass surfaces. The secret to the durable protection of Jet Seal is Nano-Tech polymers that create a shield for the ultimate level of shine and protection. Our all-new formula features improved durability, superior shine and easier application. Experience the durable protection and brilliant shine of Chemical Guys Jet Seal.